Every spring Dayton Regional STEM Fellows collaborate to provide students opportunities to interact with local STEM government and industry representatives. Often this is done in the form of classroom engineering design challenges, classroom visits and career day guest speaker events. Opportunities for students to explore cutting-edge local STEM careers and career skills are hard to come by. However the collaborative setup of the DRSC’s unique programming fosters rich relationships that directly result in educators, STEM higher ed, and STEM industry/government representatives meaningfully networking. 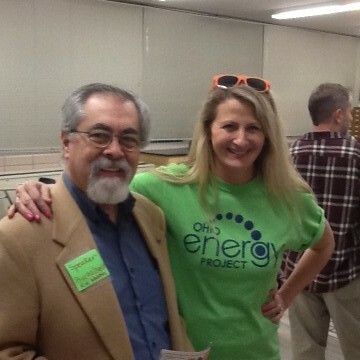 Pictured are veteran STEM Fellow Dr. Rik Warren, a research psychologist for AFRL, supporting a career day event with Melanie Byers, a 6th grade science teacher at Kettering middle school who is participating in the 2014-2015 Dayton Regional STEM Center’s Fellowship program.